Kyrgyz children receive an English lesson. The most common question they would ask us, as written in their schoolbook, was "What is your favourite hobby?". Classified as vertical nomads who herd their yak and sheep between the higher and lower regions of the Pamir, the remaining 1,103 Kyrgyz are pastoralists who have been living for centuries in the harsh environment of Afghanistan’s north-easternmost area of the Wakhan corridor, the Pamir region. 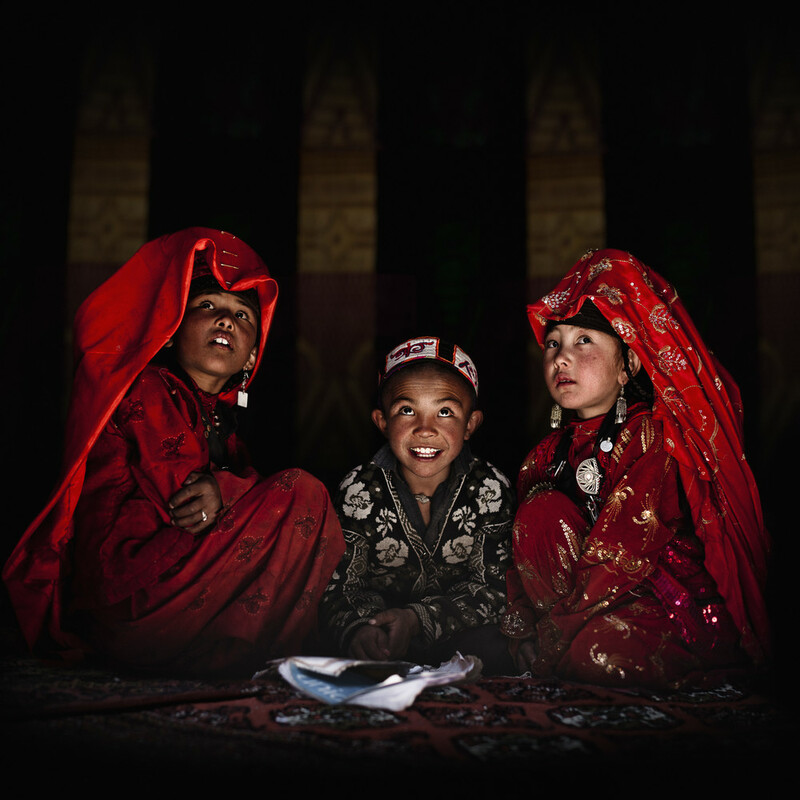 They are the last remaining ethnic Kyrgyz in Afghanistan. The Kyrgyz’s closest neighbours are communities of Ismaili Shia Muslim Wakhis, concentrated one level below them in the Wakhan Corridor, at 2,000–3,000 metres, who engage in agriculture. The Wakhis and the Kyrgyz have cordial ties based mainly on bartering (of livestock and agricultural products), according to Khair Mohammad Haidari, member of the Afghanistan Academy of Sciences. In 2011, inspired by an article published by the New York Times, I, along with cultural entrepreneur Fabrice Nadjari, decide to embark on a journey of discovery into the remote Wakhan corridor in northeastern Afghanistan, untouched by the war and preserved from the Taliban regime. Equipped with photo, video and sound paraphernalia, transported on the backs of donkeys laden with solar panels, we trekked 180 miles along that closed corridor, from the beginning of the Hindu Kush mountains to the western Himalayas and the border of China, to meet and document the lives of these villagers, farmers, herders and nomads, surrounded by almost impassable limits. What we discovered during those weeks of treks is an « untouched » Afghanistan where the values of sharing, welcoming and brotherhood remains the one inspired by the books of Jospeh Kessel and Nicolas Bouvier. All through our journey, we share their life of hardship, their diet of low-calorie bread, tea, yak milk, and, rarely, small quantities of rice. Every encounter reminds us the contrast between our Western lives and the precarity of theirs, where life expectancy stops short at 50 and where infant mortality verges on 60% - the highest in the world. But we are also confronted by many contradictions. Living on the highest plateaus, far from any village, in a constant state of precarity where finding a potato or a piece of fruit is three-week walk away, we find solar panels, satellite aerials, television sets, and an impressive array of batteries, cables, and chargers. Our hosts frequently thank us for coming to meet them and for taking an interest in their lives. Repeatedly, we feel the sadness in their gaze as they watch us leave again. I have the feeling that they are somehow counting on us from the moment we are welcomed. Perhaps their regard expresses the many unfulfilled promises of improvement of their conditions (schools, medical treatments, economic assistance) by the central government. We ask ourselves what will we share upon our return? What have we learned? So, it is with profound humility that I have chosen to share these images with you in the hope that they reveal enduring, proud, and peaceful portraits of the ethnic Kyrgyz people you will make yours.